Cristiano Ronaldo was invited to visit Instanbul in Turkey this weekend, by Besiktas President, Yildirim Demioren, a good friend of Ronaldo. CR7 simply drove Turkish fans crazy, in what was an apotheosis reception, with the song "We are the Champions" from Queen, playing in the background. Followed by his Russian girlfriend, Irina Shayk, Cristiano Ronaldo witnessed an impressive welcoming in the Istikal street, in Taksim, in the opening ceremony of a new shopping mall. Cristiano Ronaldo had already passed through a very big crowd of fans in Atarük's airport and could only reach his hotel in the center of the city by travelling in a helicopter! Cristiano Ronaldo arrived to Instanbul surrounded by a strong security contingent and was "attacked" by hundreds of journalists, who were starved to get close photos and statements from the Portuguese superstar. There were also plans to make an autograph session, but due to security issues, it had to be cancelled. Therefore, and as an alternative, Cristiano Ronaldo showed up in one of the shopping mall's balcony, in order to wave to the fans in the crowd, but also to address some words to everyone. Cristiano Ronaldo: "I'm here after being invited by Besiktas President, who is a good friend of mine and I'm very grateful for this reception, so thank you to everyone." The Turkish media and journalists were all insisting on doing the same question to Ronaldo. As everyone can imagine, they all wanted to know if Cristiano Ronaldo would be willing to play in Besiktas in a few years. CR7 gave a diplomatic answer and simply said: "I don't know, maybe...". The madness continued on the streets, in what was an another example of how football is lived with passion in Turkey. 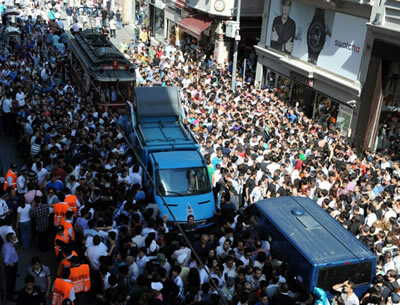 Several stores had to close in one of the most busy streets of Instanbul, due to safety concerns. Even though Cristiano Ronaldo left the "door" open for a possible future transfer to Besiktas, most likely that won't happen in the coming years, so all Real Madrid fans have no reason to be worried about losing Ronaldo anytime soon.